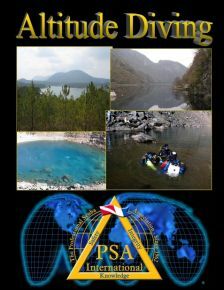 There can be little doubt when one looks at the 180 page PSAI Altitude Diving Manual, just how comprehensive this book is. One would expect this, as PSAI Executive Chairman, Gary Taylor and author of the PSAI Altitude Diving Manual, pioneered many innovations for the use of mixed gas at altitude such as the Theoretical Ocean Air Depth (TOAD) Methodology, the Nitrox to Sea-Level Air Equivalency Method, the Air at Sea-level Altitude Equivalency Chart for the use of Nitrox at altitude, as well as many other innovations. The History of Altitude Diving. Equipment Considerations for Altitude Diving. Physiological Considerations for Altitude . Using the U.S. Navy Tables and the Theoretical Ocean Depth. The Bühlmann Air Dive Tables. Nitrox Methodologies for Altitude Dive.